The acronym for system is save yourself time energy and money. But one of the biggest ways to destroy your time is reinventing the wheel. Having a Network Marketing System helps you keep the main thing the main thing. What I mean is that often when people get started in the industry they are full of excitement and filled with ideas of how they can work their business. So they let their creative juices start flowing and start dissecting the system and adding to the system with the intent to improve upon it. Thinking like this may seem incident but whats driving the thoughts is ego. Your ego is saying I know better or I know what works for me. The truth is you don’t know what works best for you because if you did you would have already done it and got the results you wanted. This was a huge time waster for me when I first got started. I thought well “How can I turn these 5 steps in to 3 steps.” I would spend hours creating this mega system plan all the while earning $0.00. It makes no sense now but I truly thought at the time if I built the perfect system then the prospects and money would be rolling in. Needless to say, not so much. You have to put your ego to the side, humble yourself and follow the proven system already in place. Its a proven network marketing system because people are getting results. By diverting your attention from following the system and doing income producing activities you are actually making your brain work harder instead of smarter. And this can lead you down the rabbit hole of self sabotage. You start doubting and questioning everything when in fact you just need to be coachable. Now this information also applies to you if your company or leader doesn’t have a system in place. You still shouldn’t create your system. There are several generic network marketing systems out there that can help you build your business. Todd Falcone a legendary industry leader says that you should not make any tweaks, improvements or suggestions to any system until you get your income up to a consistent $10K/month and I completely agree. Check out the video below where I share with you 3 reasons why you would be crazy pants if you don’t have a network marketing system working for you like a well oiled machine. If you are a Part-Time Marketer, listen up. To learn how you can make this network marketing system work for you in your business. Visit FreedomOnPurpose.com to get access to our Elite community that will help you avoid wasting time and show you the fastest path to cash. Totally agree with Yvar. I have been there done that. Successful people create systems and all we have to do is follow the bouncing ball.Thanks for sharing this. David Thompson recently posted…Do You Have A Relentless Marketing Approach? Great advice. Don’t try to reinvent the wheel. 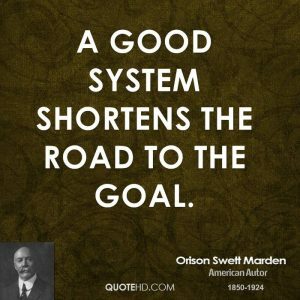 The system that your company already has in place might not be perfect (it never will be) but it works very very effectively. Every single long term successful person I know has creates a system ad TEACHES others howto use it at different levels of attainment till they get into thousands of coaching fees…and thats how it works. Anyone who intends to stay in affiliate marketing for long needs to start LEARNING and TEACHING ultimately creating content taht otehrs find valuable and pay to. Awesome network marketing system tip Yvar! Oh yes Yvar you share some great points. Systems for online business is meant to leverage marketing know how but when you try to reinvent that wheel it appears its the system that isn’t working rather than the business owner or marketer that isn’t working system correctly. Its an important message, thanks for sharing.